Last night, the Planning Board approved a subdivision modification, scheduled a hearing for a subdivision, and had a sketch conference on yet another subdivision, before talking about the agricultural parts of the Draft Comprehensive Plan. The first discussion dealt with a request by Anne Marie Card to change a 1989 subdivision on Annee Lane (map). The modification took one parcel and divided it between two other parcels. The Planning Board approved it. 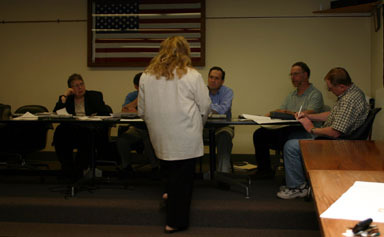 The second subdivision discussion was a sharply modified version of an earlier proposal. The county rules for subdivisions would require the creation of topographic maps and other data, costing around $40,000. To avoid that, Joan Portzline and Daniel Armitage have changed plans, shifting to an approach that only creates four lots, parcels A-D on the map. The new plan creates three lots - two 1.5 acres, one 3 acres - on Sheldon Road, and one of 6 acres on Wood Road. Planning Board member David Weinstein noted that the county's approach, by making them do the subdivision in smaller chunks, took control of the overall plan from the town as well. The details of how the subdivision process works and how the county process differs were intricate. Portzline, a long-time realtor, said that "this has been an education for me, after twenty-eight years in the business." The board scheduled a final hearing for this subdivision for the next meeting. Joan Portzline explains details of the Barrett Farm subdivision to the Planning Board. Portzline had a sketch for a second subdivision of the same original piece of property, called the Barrett Farm subdivision. This subdivision would create three 5 acre parcels at the corner of Wood and Etna Roads. The board scheduled a preliminary hearing for this subdivision for next month. After the subdivision hearings and an approval (with modification) of the minutes, the meeting turned to discussion of the subject that dominated the comprehensive planning part of the previous meeting, agriculture. A map of agriculture districts was on the table, and Environmental Planner Debbie Gross had sent a list of smaller farms in the town. 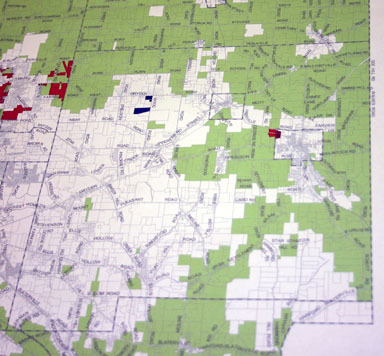 Dryden agriculture districts, with proposed changes: additions in blue, removals in red. Planner George Frantz, as requested, had created a draft description of how the fixed ratio zoning works, showing how using a ratio of land in agriculture to land available for residential development would create a way for farmers to sell lots while keeping good farmland in use. The example in the draft shows parcels fully built out, a scenario that isn't likely to happen quickly. Frantz noted a current controversy in the Town of Ulysses, where some people want to change the rules for subdivision to rely on road frontage rather than area, something that would preserve vistas but not necessarily farms. He described how these had been used in Pennsylvania, notably in York and Lancaster Counties, and how they seemed to work, though some towns were moving toward 1:20 or 1:40 ratios rather than the 1:10 proposed here. Ken Miller, a farmer from Richford who works land in Dryden, was there once again with questions. He didn't see the kind of development pressure that those places had faced appearing in Tompkins County any time soon, and was concerned that restricting development on agricultural land would affect the assessed value of the land and therefore the credit farmers could get to run their operations. He said that farmers at a recent Ag Board meeting Frantz and Planning Board Chair Barbara Caldwell had attended seemed rather disgruntled after they left. Board member David Weinstein pointed out that Miller was both trying to claim that this wasn't necessary because of low development pressure and claiming it was hurting him by keeping down assessments that would only rise if there was lots of development pressure. George Frantz said he had talked with the agricultural credit people, and didn't believe that their assessments worked the way Miller suggested. Board member Joseph LaQuatra also pointed out that farmers leaving farming could request rezoning from the Town Board, and subdivide after that. Miller didn't seem entirely happy, but there will be more conversation on this, as the board prepared to send Frantz's draft out to a list of farmers and agribusinesses. David Weinstein also brought up issues with the land on the town's western edge between Route 13 and Hanshaw Road, which the Future Land Use Plan (301KB PDF) currently shows as Office/Industrial/Research. There are wetlands there, and Weinstein hoped to avoid creating another mixed residential/commercial/industrial area. The board agreed to make some changes. Frantz also said that the Cornell class that will hopefully do architectural charrettes for Varna and Etna will probably be in Spring 2005.